Giorgio Trobec is an easily likeable artist. Trobec is almost child like in his enthusiasm. He says that he does not like art that is too realistically representational and this is why he allows his imagination to run wild when he portrays a harbour or a landscape. His boats have vast prows, stern lines that wriggle their way across the canvas, doors that touch at crazy angles. 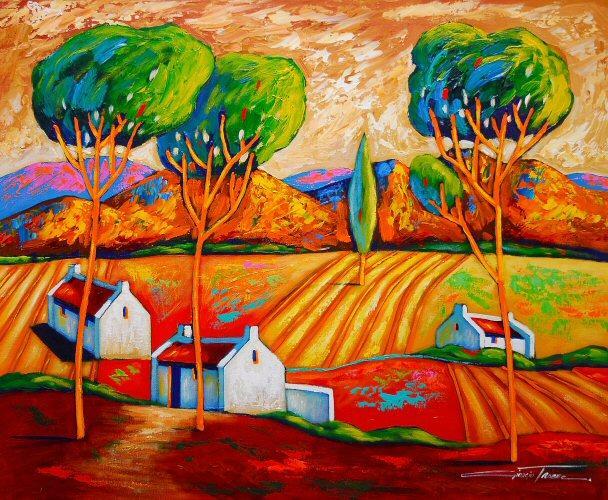 He uses colour with a gleeful abandon that is all the more effective for its impact. Fauvism is very much a colourist's medium. An artist of Italian origin, Giorgio was born within the ancient city gates of the Renaissance City of Florence, on St Valentine's Day in 1944. His father scootered the family around on a Lambretta. This is where he started storing those mental images of Italian seaside villages with deep blue seas, cobbled streets and boats packed to the gills. "I remember them so clearly. Those seaside towns and the countryside of Tuscany. Both have formed a strong basis for my art in recent years. I must add that I don't like to have too clear a memory of those places we visited. I enjoy a vision, perhaps some small detail and then I use my imaginations to tease out the painting. I want to make a painting that says this work is by Giorgio Trobec. They are playful, fun and usually everything is very disproportionate in size." Giorgio combines a sense of tradition with a mischievous sense of fun. He arrived in South Africa with his family as a teenager. Encouraged by his artist mother Vittoria, he experimented with various materials and techniques, producing 3-D murals of exciting scope and range in the 60's. Largely self-taught, he also trained as a draughtsman. This, together with his employment as a full-time in-house artist for leading stores, equipped him to start his prolific career as a painter. His subjects are as accessible as they are varied, in a buoyant and pure palette. 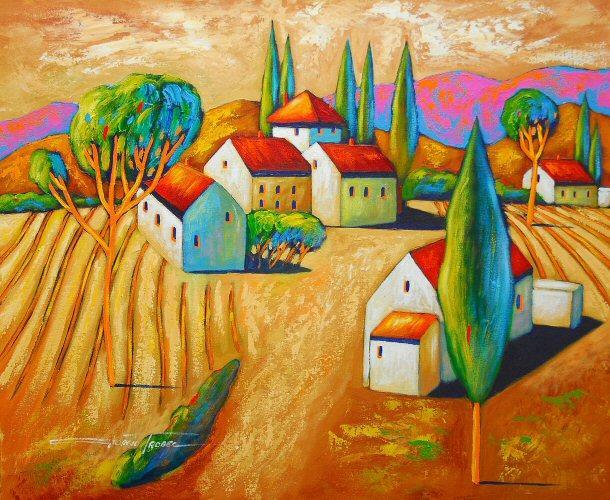 Currently, Giorgio works in acrylic and oil, with a vividly joyous palette. Although specializing in vibrant landscapes, he also captures everyday moments, including various modes of transport, naïve as well as witty renderings of boats, taxis and planes, scenes and objects with a startling closeness of paint. His fresh and unique style draws mostly from the fauvist experience, internalized as an entirely personal statement these playful, but insightful works are an adult adventure on the high seas of remembered childhood. Trobec has exhibited in Germany and Sweden and is widely collected in this country.